Anna university, Chennai organizing the Tamil Nadu Common Entrance Test (TANCET 2014) Entrance Exam for the admission into various P.G. courses like M.Tech, MBA, MCA, ME, M.Arch, M.Plan etc. All the interested candidates can apply online through the official website of Anna university – www.annauniv.edu. These P.G programmes are offered by Anna university and various Government, Semi-government, Self – financing colleges and universities in Tamil Nadu. There are a number of colleges allowing the students for direct admission in these courses on the basis of TANCET 2014 Exam Marks / Scores. Please check the following details regarding this entrance exam before applying online. 1. All the interested candidates must have Bachelor’s degree with minimum 50% marks in any discipline from any recognized university. 2. 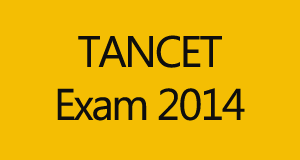 All those candidates who are currently in final semester or year of the Bachelor’s degree programme, are also eligible to apply for TANCET 2014 Exam for the admission into MBA, MCA, M.E./M.Tech./M.Arch./M.Plan. Remember: The application form is common for all courses, one candidates can apply online once for one or more course/programme. A single D.D. (Demand Draft) is enough for one or more course/programme. All the interested candidates can apply online for Tamil Nadu Common Entrance Test (TANCET 2014) from 1st February 2014 through the official website of the Anna university- www.annauniv.edu. Click on the following direct link to download Advertisement before applying and then click on apply online link.